I was looking through some old pictures today - searching for something completely different - when I came across some pictures and a link to this recipe. I can't believe I never posted it here! Of course, it is really pretty on tabblo, see for yourself - Caramel Rolls. I wish I could embed it full-size here, but I'll just copy and paste the recipe, and if you want to see the completely illustrated version, just click the link. 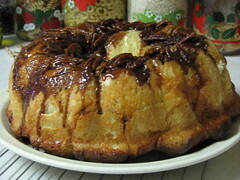 Grease large Bundt pan. Mix together pudding, brown sugar, cinnamon and nutmeg; set aside. Put pecans in bottom of the pan, then the pieces of dough. Sprinkle pudding mixture over the top and drizzle with the melted butter. The next morning, preheat the oven to 350° and bake the rolls for 25-30 minutes. Remove from the oven and invert onto large platter. Serve at once. I've never bought the frozen sweet bread dough, though that's certainly an option. I just make the sweet roll dough I use for my Cinnamon Rolls and freeze it in zipper bags. When I want to make these rolls, I pull it out and let it sit for a few minutes, to soften it enough to cut into pieces then follow the rest of the recipe. These are easy and yummy! Try them for yourself and let me know what you think.